Romeo Langford announced his commitment to IU in a 30-minute ceremony at New Albany High School. Langford picked IU instead of Kansas and Vanderbilt. IU Coach Tom Allen is looking to find leaders among a relatively young defensive group. Rashard Fant and Simmie Cobbs Jr. both improved on disappointing NFL combine showings. Five IU players participated at the NFL combine and six more will join them Tuesday. IU's junior class was small this season, but it included two of the most important players on the team. 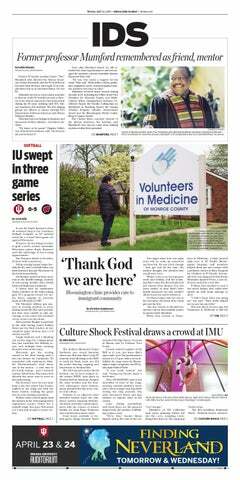 Following IU's early loss in the Big Ten Tournament, the IDS reviews the men's 2017-18 season class by class. The 2017-18 season was marked by injury, transfer and flashes of brilliance from IU's sophomore class. Jonathan Albomonte, a current IU player, and Thomas Henderson, a former player, were arrested on charges of dealing marijuana. The Hoosiers jumped out to a dominant early lead, but fell apart by halftime and couldn't recover. IU beat Rutgers earlier this year on the road, but the Scarlet Knights were without key players. The senior guard scored 17 points in what was likely his last home game as a Hoosier. The IU careers of Johnson, Newkirk, McSwain, Hartman and Priller will be celebrated Friday night when the Hoosiers play No. 16 Ohio State. The Hoosiers turned the ball over 19 times in their loss on Tuesday night. Free throws and bench production helped IU hold off a tenacious Illinois team. Eighteen turnovers and late-game struggles cost IU a win against Illinois in January. Devonte Green had 17 first-half points and a career-high seven assists Friday. 3 high school players signed their National Letters of Intent on Wednesday.